This Week's TV: Game of Thrones ends, four new shows begin! How much darker can Game of Thrones get? Find out in the season finale on Sunday! But first, it's time to get together and form...Voltron! Plus aliens conquer the Earth, humans colonize a new world, and a girl gains superpowers. There are four new television shows debuting on your screens this week, plus the return of a few other favorites. The summer TV season begins in earnest this week, and we've got all the details below. Johnny, the twins and Mom realize it's Father's Day, and they don't have a gift. They try many disastrous attempts, making Dad wish they had never remembered! That's followed at 7:30 by a new Amazing World of Gumball. Then there's a new Regular Show at 8:15, a new Mad at 8:30, and a new Problem Solverz at 8:45. Scott's (Tyler Posey) first date with Allison (Crystal Reed) ends up in the confusion of the dreaded "group date," with Lydia (Holland Roden) and Jackson (Colton Haynes) in tow. Meanwhile, a mysterious animal attack has Stiles's (Dylan O'Brien) father, Sheriff Stilinski, on the lookout. Also at 10 PM: a new Sanctuary on Syfy, "Out of the Blue." Magnus and Will awake in a strange and terrifying world: The suburbs. And then at 10 PM, National Geographic Wild has the season finale of Man V. Monster, "Amazon Terror." When a sardine boat mysteriously disappears when fishing in Dead Man's Point, Velma goes to investigate, only to run into a mermaid and a couple of fish freaks, who seem to be behind the disappearings. At the same time, Destroido plans to start pumping oil from an old oil platform in Dead Man's Point. Could the two be connected somehow, and how does Angel know so much about it? And that's followed by another episode of the Looney Tunes Show at 8 PM. The new one-hour scripted action drama follows Chloe King, who is looking forward to celebrating her 16th birthday with her friends and single mother — just like every other year - that is until she starts developing heightened abilities and discovers she's being pursued by a mysterious figure. Chloe soon learns she's part of an ancient race called the Mai, which has been hunted by human assassins for millennia - and that she may ultimately be their only hope for survival. Struggling to understand what fate now has in store for her, Chloe begins to uncover more about her newfound abilities. Overwhelmed by all she is learning, she wonders how she'll be able to reconcile being a normal girl with an extraordinary destiny. With her childhood best friends, Amy and Paul, by her side to support her (despite being shocked to learn of her supernatural powers), Chloe must also figure out how - or if - she should tell her mom, Meredith, with whom she shares a very strong bond. And as with any teenage girl, Chloe develops a crush on a new boy, Brian, whose charming and unpretentious nature contradicts the wealthy lifestyle in which he grew up. As she explores her relationship with Brian, Chloe learns that, when it comes to guys, things are much more complicated than they appear. To help Chloe understand the history of the Mai, two of her fellow students, Alek and Jasmine, reveal to her that they, too, are descendants of the ancient race. She also learns quickly that the two just may be her best protectors - and Alek may prove to be something more altogether. The story of the Mai is the background mythology for the ABC Family series. The supposed offspring of the Egyptian goddess Bastet, the Mai are considered to be both gods and humans. From the very beginning, the Mai have had a symbiotic relationship with humans and have been frequently referred to as their protectors. At 9 PM, the History Channel has a new special in collaboration with Popular Mechanics, 101 Gadgets that Changed the World. The editors of Popular Mechanics and a panel of experts join forces with HISTORY to rank the most influential inventions of the past 200 years and tell the surprising stories behind them. There's much more to these everyday gizmos than meets the eye. Take the blender, for instance. Yes, it can make a mean margarita, but it also helped Jonas Salk create the polio vaccine. And then there's the safety razor. It's a personal grooming device, but also a life-saver: It allowed World War I soldiers to remove their facial hair so gas masks would fit snugly and work properly. As viewers will discover, these and the other 99 gadgets ranked in this fascinating special qualify as modern conveniences, but they've also played a significant role in shaping history. Also, Mythbusters is back at 9 PM, with "Planes, Trains and Automobiles." The MythBusters count down their favorite, most spectacular and downright daring transportation moments ... and give you the inside scoop on each. And then at 10 PM, there's a new episode of Through the Wormhole with Morgan Freeman on the Science Channel, in which we ask, "Is there an Edge to the Universe?" Voltron is back! There's a 90 minute premiere of Voltron Force on Nicktoons, with "New Defenders Trilogy," three episodes in a row. The series will launch as a commercial-free presentation of the 90-minute movie, "Voltron Force: New Defenders Trilogy," Thursday, June 16, at 8:30 p.m. (ET). 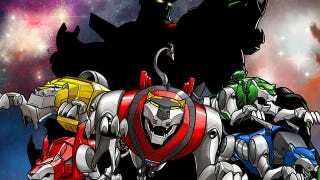 The half-hour series, which features an all-new theme song produced and recorded by Grammy Award(R)-winning producer and artist Swizz Beatz, follows the adventures of a new class of recruits as they join forces with the original team to fight evil by forming Voltron, the legendary super robot. There's a new Known Universe on National Geographic at 9 PM, "Escaping Earth." Engineering in space represents the future of human civilization but also poses some of our greatest technical difficulties. Building in zero-G is like constructing a ship at sea while it's moving. We'll travel to NASA's tool lab and see the gear we need to build in this challenging environment, from high-tech wrenches and hammers to the ultimate robotic handyman. That's followed at 10 PM by a new National Geographic Special, Earth Under Water. Miami, New Orleans and New York City completely under water it's a very real possibility if sea levels continue to rise. In Earth Under Water we'll see these events unfold as leading experts forecast how mankind will be impacted if global warming continues. They'll break down the science behind these predictions and explore ways humanity could adapt, including engineering vast dams near San Francisco, or building floating cities outside of New York. Alex wants to meet Mason's parents but for some reason he is avoiding doing so. Meanwhile, Max accidently turns his parents into toddlers after trying to make thier food taste good. BBC America is showing the first four hours of the Battlestar Galactica miniseries, from 5 to 9 PM. Relive the Cylon attack and all of the intensity and insanity of the BSG reboot from the beginning. Carpathia awaits the arrival of what could be the last transporter from Earth. Loyalties are tested as the head of Forthaven's Expeditionaries attempts to break away from the settlement. Here's our reaction to the first couple of episodes. Disney XD is showing another new episode of Avengers: Earth's Mightiest Heroes at 10 AM, "The Fall of Asgard." As tragic news spreads across the Seven Kingdoms, Bran and Rickon share a prophetic dream, Catelyn interrogates Jaime about her sonʼs fall, and Robbʼs destiny is forever changed. After a surprising decision by his father, Tyrion heads south. Arya assumes a new identity in an attempt to escape Kingʼs Landing, and Sansa is terrorized by Joffrey. At the Wall, Jon is forced to choose between the Nightʼs Watch and the family he left behind. Across the sea, Dany pays a terrible price for her love, but finds new hope. Episode 1.01: "Live and Learn"
The world is left in tatters after a sudden, unprovoked and unexplained invasion by aliens, leaving the planet's remaining human population to fight for survival against the occupiers. History professor Tom Mason (Noah Wyle- ER) has been named second in command for the 2nd Mass, but his real focus is on his three sons, one of whom has been captured by the aliens for an unknown purpose. While scouting for supplies, Tom, Hal and their squad encounter a gang of marauders determined to get their hands on the 2nd Massachusetts' weapons. Leading the gang is an ex-con named John Pope, who decides to use his hostages as bargaining material. And then at 10 PM, Animal Planet has a special: Finding Bigfoot: Fishing for Bigfoot in Oregon. Adult Swim is showing a new episode of Aqua Teen Hunger Force at 11:45 PM.